Rhubarb is one of our favorite springtime vegetables. We are happy to have 4 very large rhubarb plants and can harvest enough to freeze for use during the year. But today we had a tasty treat enjoying pear and rhubarb smoothies. Bring the sugar and water to boil in a medium sauce pan. Add the rhubarb chunks and turn the heat down to a simmer. Cook the rhubarb until it breaks apart. Allow to cool then strain through a cheesecloth. 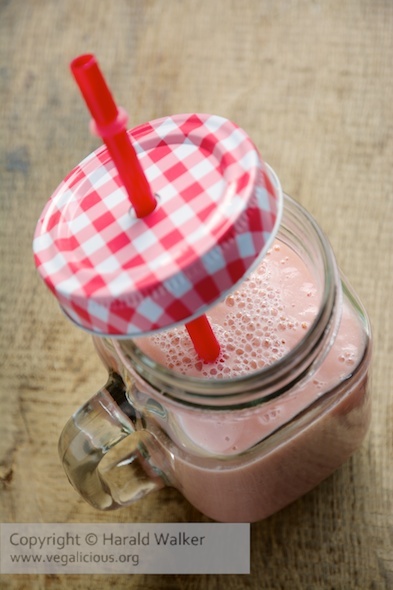 Keep 1/2 cup of the rhubarb pulp for the smoothie. Pour the strained syrup into a bottle with a cap or lid. Keep extra rhubarb syrup refrigerated. 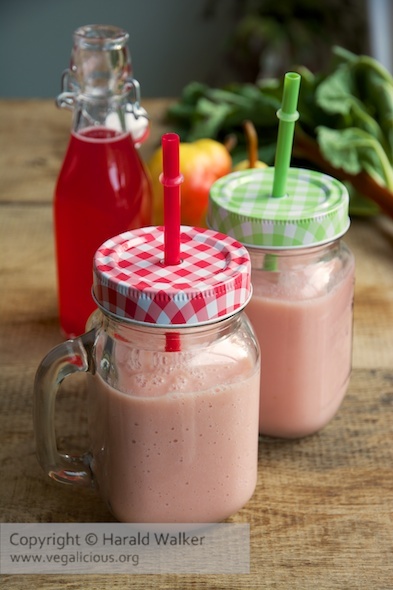 Rhubarb syrup is great for making smoothies, spritzers or even used as a sauce for pancakes. Posted by Chris Walker on May 2, 2014 in Beverages, Pear, Rhubarb, Soy yogurt.